The easy access to night skies and fresh air is appealing. 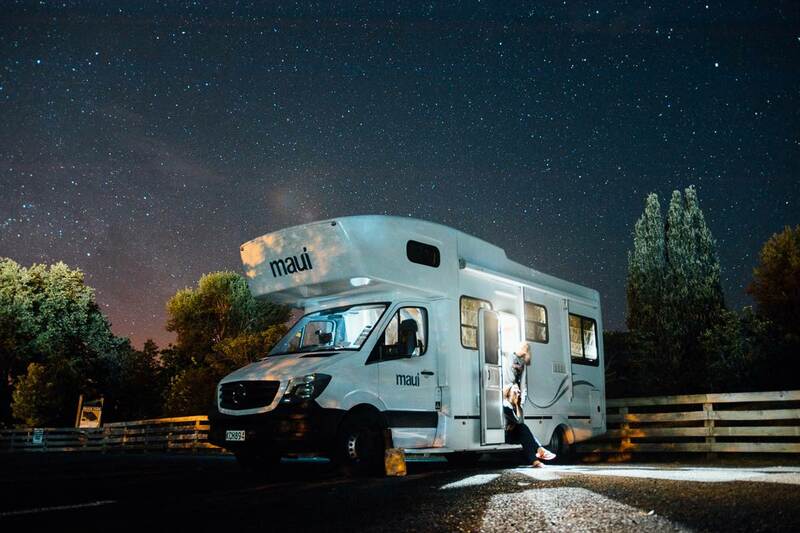 Our total miles traveling in an RV (that’s a recreational vehicle, camper, travel trailer, motor home, caravan, or what-have-you) equal zero, and it’s the same for nights spent in an RV. That’s not to say it will never happen. I think of RVing much the same way I consider being a National Park ranger. Gee, that sounds like fun. Recently, we’ve seen friends purchase or rent an RV and hit the road, as if they’d been planning this for ages. Even young worldly travelers we know are happy to take a year or two back in North America with a rolling home base. Maybe the people who’ve looked at us as if we’re crazy, for traveling the way we do, just want to sleep in the same bed every night while getting a change of scenery. Or maybe they can’t part with their dog or certain stuff. Maybe there’s something to the RV lifestyle. So we asked some people who know about the pros and cons of the RV lifestyle. 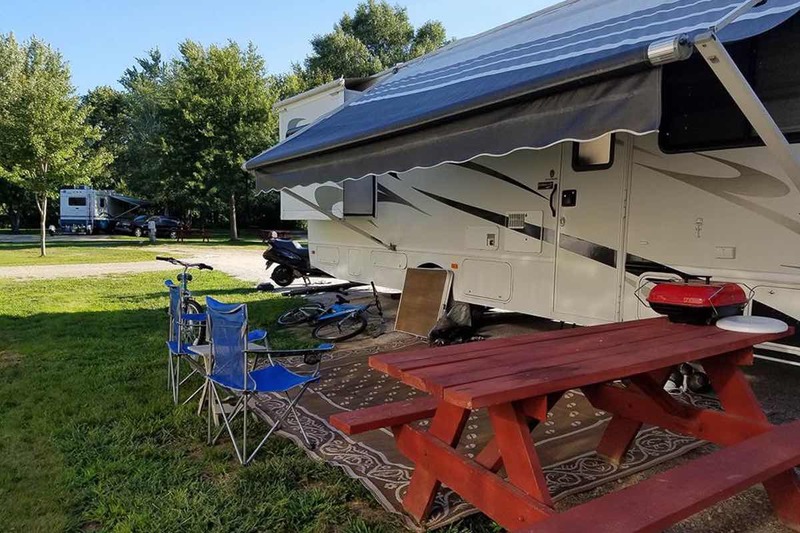 Here’s their story to jump start our research into RV rental, RV and camper styles, and notes on owning a motor home. 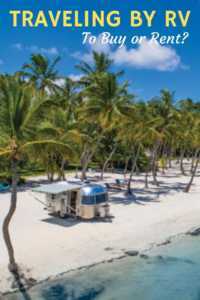 Follow a couple of the links and you’ll also be able to review RV rental costs and companies, what makes a motor home easy to drive, and other great hints for caravan or camper rentals. One of the best ways to travel, especially if you have pets or love having your possessions around you, is staying in an RV. RVs allow you to go wherever you want, whenever you want. You don’t have to worry about being stuck in one location (particularly a cold one, if you’re from the north). Case in point: my grandpa, who’s over 70, lives in his RV and travels south for the winter (and fall and spring) every year by himself. This allows him to stay warm and active. He’s been living and traveling in an RV full-time for over 2 years. He and my grandma owned several RVs over the years and lived in them part-time during the summer for more than three years before he went full-time. After hunting for the best long-term campground deals in the south, he now stays several months in one campground. He’s inspired us to start RVing full-time, and has helped us sort through the many choices to be made when entering the RV lifestyle. Here are the basic options of RV travel. The choice of parking spots is never ending. Let’s talk about the pros and cons of renting an RV versus buying one. Renting an RV is an excellent way to test different RV types and experience the RV lifestyle without committing tens of thousands of dollars on a rig. In fact, depending on what you plan on using the RV for, you could just rent every time you want to go on an RV vacation. It’s cheaper and doesn’t require storing or maintaining a big RV. We have some tips on renting an RV if you’re interested. However, if you plan on living in your RV (which we’ll talk about in the next section), then you’ll need to buy one unless you hop around multiple long-term rentals. Save money compared to buying. No need to find a place to store the RV when it’s not in use. You don’t have to pay owner’s tax. You aren’t responsible for maintaining the RV. You’ll have to rent a new RV every time you want to go on vacation. You’re sleeping in a rig many others have stayed in before you. There are rules you have to abide by. It’s yours to do whatever you please. You can just pick up and go at a moment’s notice—no need to book anything ahead of time or deal with other people. You can customize your rig to exactly what you want it to look and feel like. If you use it often enough, it can be cheaper than renting. 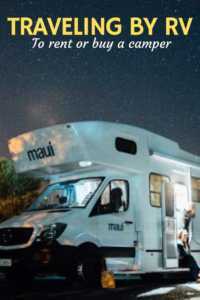 You can rent out your RV when you’re not using it, to make some extra money. You have to maintain the RV or camper, including the appliances, engine (if it’s a motorhome), battery, plumbing and electrical. Electric or hydraulic slides (those space-enhancing protrusions) need care. And the exterior requires washing and waxing. You have to find a way to store the RV when not in use. Before you make the decision to buy an RV, read the next section to figure out what you plan on doing with it! Living space is enhanced by the pop-out and by some creative outdoor living arrangements. Which type would you like to be? To help you decide, let’s look at the pros and cons of each. You’re not tied to one place. Don’t like where you’re staying? Pick up and move. You can live in some incredible places. On the beach? Check. On a mountainside? Check. Next to a lake? Check. Driving the Southern California desert? Check. You name it, you can probably live there. Things break. Your home is subject to a mini earthquake every time you go on the highway, and that causes things to wear down much quicker than a regular house. There is a bit of a learning curve. You have to learn how everything in an RV works, how to set it up and take it down, where to dump your tanks or refill propane, etc. Limited space and limited hot water. In an RV, the only space you have is your rig, so you’re pretty limited. And you have a small hot water heater. Get out of the cold weather. In fact, you can chase the best weather year-round. Being able to stay near your family for part of the year. Less commitment than full time RVing. Just rent an RV rather than buying one to save money. You may be away from friends and family for a portion of the year. If you don’t have friends doing the same thing or who live near where you’re staying, it can be lonely. Unless you store your RV down south or rent an RV, you have to drive it a far distance, which is both costly in fuel as well as taxing on your rig. My grandpa lives in his RV full-time, but he combines his lifestyle with the snowbird thing in that he heads down to South Carolina for most of fall, winter, and spring, then comes north for a few months in the summer. Of course, he drives the rig back and forth, so it is a bit taxing and fuel-intensive. Whichever method of RVing you decide is right for you, renting an RV can help. If you want to live in an RV, renting an RV can help you decide whether it’s right for you and which model you like best. If you’re snowbirding, a long-term RV rental can save you money and headache from moving or storing your rig. If you’re just taking a few vacations every year, renting can save you money and keep you from needing to store and maintain your rig. You get the idea! Have any questions about RVing, like which type of RV you should buy or whether RV living might be right for you? Ask me in the comments below and I’ll be happy to answer. Eager to get started? Click here to start planning your trip now! 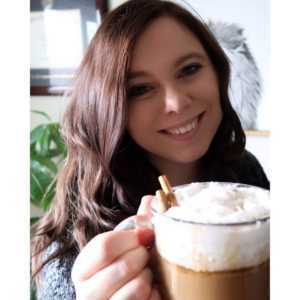 Guest contributor Kayla Widmer is a former full-time RVer and blogs about RV travels with her fiancé Bill at The Wandering RV. Do you want to save these helpful hints? Pin this post or use the social shares above. We lived full-time in an RV fir 8 years visiting 49 American states, 9 Canadian provinces, and 6 Mexican states…until my husband got tired of hooking and unhooking. It was an experience I am glad we had. Even published a book about it! Wow, that’s awesome!! What’s the book? I promised myself I will rent an RV once for a short holiday. It seems like a great experience. I love the idea of an RV (a sort of comfortable camping…) but unfortunately I’m not so keen on the idea of actually driving it around! Very interesting! My sister-in-law and her wife bought a small RV; really just a large van, but it has a full-size bed, a dining area and kitchen and a small bathroom. The advantage of a vehicle that small is that it fits in a regular parking space, so when they’re not using it, they don’t have to pay to store it elsewhere. They use it to take road trips: usually about 6 weeks at a time. It really makes me want to try one out too! I’ve always had a fantasy about refurbishing an Airstream and taking it on the road. Sadly, I think the time has passed for the refurbish part, but i would still love to spend a few months driving across the US in one. It’s the driving piece that’s the obstacle now.How many hours/day do you usually spend behind the wheel? Hey, Alison! 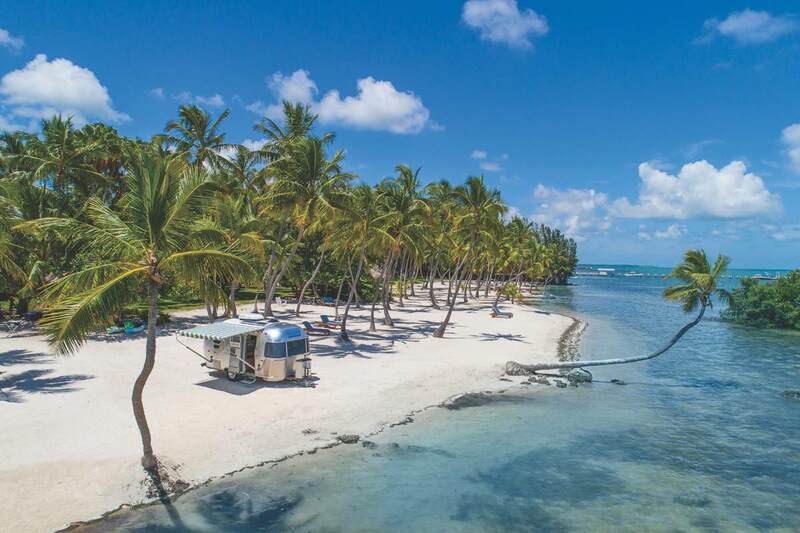 That’s awesome – we love Airstreams! We both are not big fans of long drives behind an RV. We usually don’t drive more than ~6 hours per day unless we absolutely have to rush to get somewhere. The number of days depends on the math, really, but we like to take our time and spend a few days in a location at a minimum before heading out. Usually no more than 3-4 days of driving in a row, max. But those days are a bit rough! You can even rent for a few months from some people, it’s pretty cool! Hope this helps! !